Pandesal (Pan de Sal) which means salt bread in Spanish is a famous roll in the Philippines. It is usually eaten during breakfast to accompany a morning cup of coffee, but it is good for snacks too. It is made of flour, eggs, yeast, sugar, and salt. It is the most popular yeast-raised bread in the Philippines which can be eaten plain or with “palaman”(filling) like butter (or margarine), fruit jams, and peanut butter or anything your taste buds want. I love it with corned beef, sardines, scrambled eggs and Viena sausage. 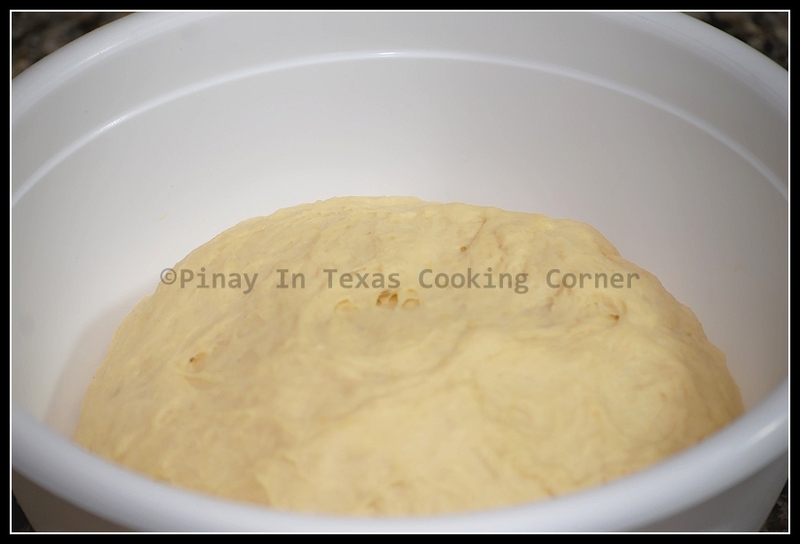 In the Philippines, pandesal is sold everywhere: bakeries, market, grocery stores, and convenience stores…but here in Texas, you can rarely find it…so the only way to enjoy it is to bake it from scratch. I tried it twice already, and it came out good. I even put filling in some of my pandesal dough so I wouldn't have to slice it after baking. Yummy indeed! It’s a little time consuming to prepare like siopao, but it’s worth it! * I shared this on Let's Break Bread Together , Melt in Your Mouth Monday, Hearth and Soul Hop, Delectable Tuesday, Tempt My Tummy Tuesday, Tasty Tuesdays, Tuesdays At The Table, Made From Scratch Tuesday and What's On The Menu Wednesday. 1. Dissolve yeast and sugar in warm water. Let stand for 10 minutes. Be sure to use just warm water. Too hot water kills the yeast. 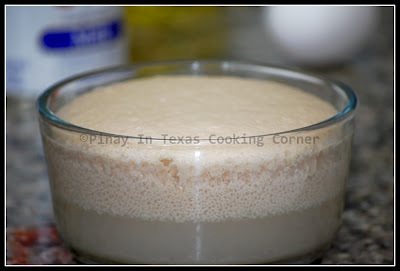 The mixture should increase in volume if the yeast is active. 2. 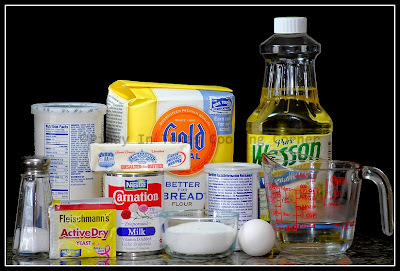 In a large bowl, combine 4 cups bread flour, ½ cup sugar, baking powder, and salt. Mix well. 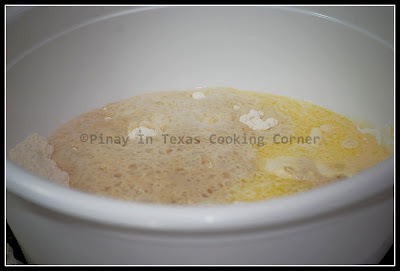 Add the butter, milk, egg, vegetable oil and yeast mixture. Mix until well combined. 3. On a clean surface dusted with flour, knead the mixture into a smooth elastic dough. Shape into a ball and put back in the mixing bowl. Cover the bowl with plastic wrap and let the dough rise for 30 minutes. Knead the dough again, shape into a ball and put back in the mixing bowl and let it rise until it has doubled in size, which is about 45 minutes. 4. Punch the dough, knead again and divide the dough into three for easy rolling. 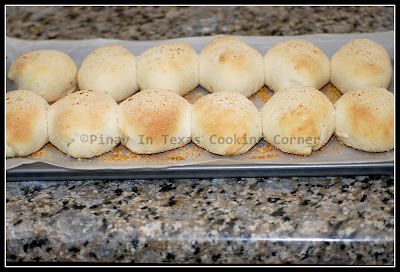 Roll each piece of dough into a log about 2 inches in diameter. Using a dough cutter or a flat knife, cut the log diagonally into pieces of desired thickness. Mine is about 1½ inches. 5. You can put filling in the pandesal just like I did with 2/3 of my dough. 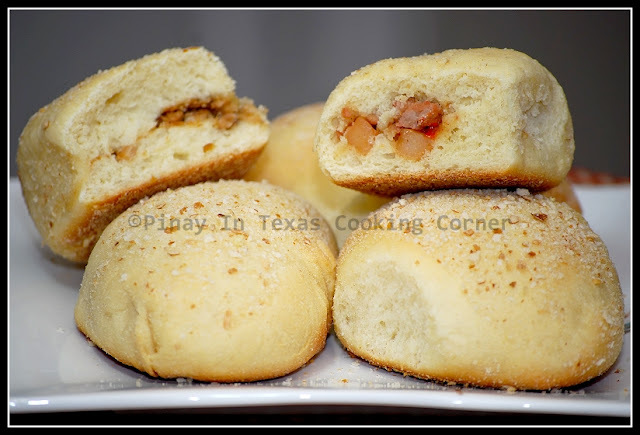 The first time I made pan de sal, I used corned beef and viena sausage, then sardines and sauted ground pork the second time. If you decide to do so, put your desired filling in the middle of the dough then let the edges meet. Seal and shape into oval. Roll over breadcrumbs and arrange on a cookie sheet covered with wax paper. 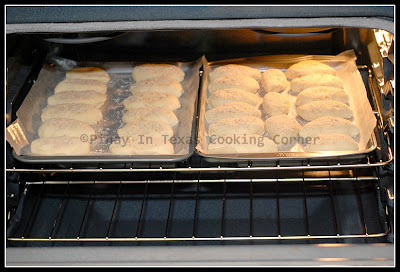 If you don't like filling in it, just roll the dough pieces on breadcrumbs and arrange on the wax paper covered cookie sheet. 6. In the Philippines, pandesal are baked in such a way that they stick to each other. I want that in my pandesal so I put the dough pieces on the cookie sheet with just 1 cm gap. If you don't want them sticking to each other, leave a larger gap between each piece, about 1 ½ inch. Let the dough rise for about 15 minutes, the last time before baking the bread. 8. Pandesal is best enjoyed straight from the oven. But you can also reheat left-over pandesal either in microwave or oven toaster. Pandesal can last up to a maximum of five days. Put them in a ziploc bag and store in room temperature or in the refrigerator. Oh my god! As a kid it was my duty to wait in front of the house every morning for these! Memories! Oh yum! These look so inviting! I love the idea of putting the filling inside before baking them! Great recipe... I have to say that I really enjoy the filipino recipes you are posting! I am learning so much! Thanks Tina! @Eizel: That used to be my brother's job! Mine was just plain enjoyment of pandesal. :) And tnx, Cherlin is feeling better. Those look so yummy! Thanks for linking up with Made From Scratch Tuesday! I hope to see you back next week! They look very appetizing! I wish I had couple of these at my work today! How interesting, a salt bread that's a little sweet and great with filling. I bet quite a few people have some leftover corned beef to stuff into these treats this week. Thanks for linking up with the Hearth and Soul hop. I have an event ongoing at my space which revolves round bread or recipes that involve bread in any form. Do drop sometime to take a look and link up any recipe of your choice! That was a beautiful recipe!Thanks so much for linking up!I do hope you little one is feeling much better than before. Yum, yum, yum! That really looks like the one from the panaderia. I love all the palaman you used, especially the Ligo sardines. Well, Nothing better than a this dish, That's so yummy, I served this recipe before two days in our family party and every one gives a great reviews about it, plan to cook it once again. I remember pandesal as a kid in the Philippines and growing up here in the States. It is best to eat in summer sessions with warm test. Will definitely be following your blog for more Filipino foods. HI, thank's for posting this. I wonder how can I print the recipe? Thank you very much and more power to you. Glad to know that! It's a pleasure to be able to share recipes through this blog! Hi Pinky! Glad to know that your pandesal turned out good! Hope you'll get to try other recipes here on PiTCC. Thanks and God bless! Hi,just tried your siopao recipe a week ago&it turned out really good that my husband requested it again today&now i'm trying to make pandesal from ur recipe&hoping that i executed it well,Still waiting for my dough to rise :) Thank you so much for sharing your easy and tasty recipes.No doubt i'll try your other recipes.Godbless!!! Thanks for your message! I'm glad that you liked the siopao. Hope the pandesal also turned out well! Hi,I tried your pandesal recipe and it turned out good...but Im wondering if the dough can be frozen just like those dinner rolls then bake it as needed? Thank for sharing you recipe. I honestly haven't tried freezing the pandesal dough. But I'm pretty sure that like any other dough, it will work for pandesal too! hi. I tried this recipe two weeks ago and it turned quite well that my cousin said that we could make it as a business. having hot pandesal here in athens straight from the oven is a taste of heaven! thanks for the easy to follow recipes, i have done a number of yours already and all turned out perfectly well. thanks a lot for your blog! I'll definitely be trying this. 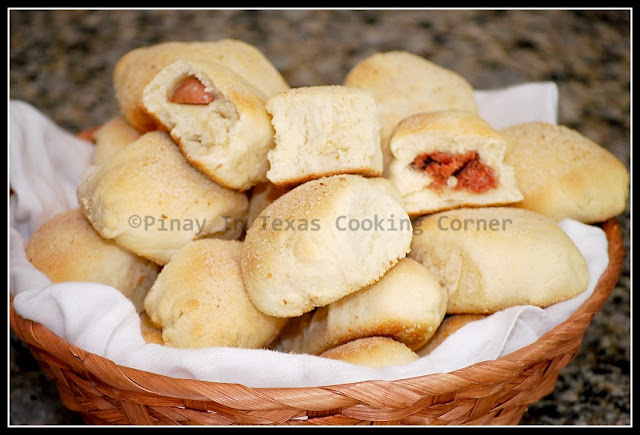 Have tried out a lot pandesal recipes and none of them turned out well. I'm pretty sure this one will do as I've tried your other recipes and all of them earned me credits everytime I made them. Glad I found your blog Tina. Thank you for sharing. Don't forget to share PiTCC with your friends! Shud I cook d filling before putting it on d dough? How do I season it? If you're going to use canned filling like corned beef, sardines and luncheon meat, you can use them as is. Other fillings should be cooked first. Thank you for posting this, I've been looking for this pandesal because I also want to make from scratch instead of going to Filipino store... It's a drive away just for pandesal plus gas... Since I came here in cali, I always miss the pandesal in the morning, snacking and anytime of the day. I love it with almost anything like coconut jam, "saw-saw sa kape", and sardines too! But most of all is to pair it with hot pancit bihon or canton gisado. thank you so very much for your pandesal recipe. i would want to try and bake it tonight, however, i do not have baking powder at the moment, would it still turn out alright without it? It will turn out fine though not as fluffy.